Board and Bench Publishing, 9781934259610, 288pp. 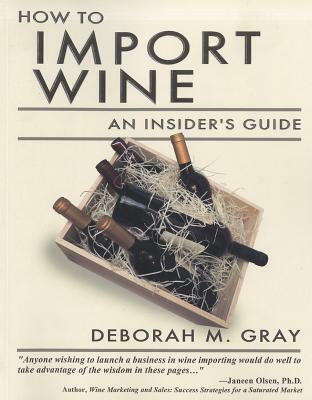 In the first book of its kind, author and veteran importer Deborah M. Gray offers the benefit of her vast experience in this comprehensive guide to the perils and best practices of the fascinating career of a wine mporter.She gives invaluable insider information and the necessary tools, resources, and real world advice to create a strong business model and a portfolio to match. She details the critical considerations in branding, packaging, pricing, licensing and regulations, shipping, warehousing, marketing, and more. The book is filled with specific examples of importing triumphs and failures, with particular interest paid to arguably the most important element of business success: acquiring and maintaining effective distribution. Deborah M. Gray is a wine importer who has worked with distributors throughout the United States, conducted wine dinners and tasting, and spoken at wine festivals, and on radio and television. She lives in southern California.